Canada is signaling that this week’s NAFTA deadline could come and go without a deal — with Prime Minister Justin Trudeau citing a “range of paths” forward while his U.S. envoy digs in on two issues. Trudeau and David MacNaughton, the ambassador to Washington, each addressed the North American Free Trade Agreement in separate appearances Sept. 26, striking upbeat tones without giving any indication of a frenzied push to reach an agreement. The United States wants to publish text of a deal with Mexico, and possibly Canada, by Sept. 30 . Trudeau downplayed the urgency of that deadline. His comments, along with those from President Donald Trump’s trade representative, Robert Lighthizer, on Sept. 25 suggest the United States will publish text of a deal with Mexico while somehow continuing talks with Canada, and holding open the possibility of tucking the northern nation into the deal at a later date. The United States has said it will sign a deal with Mexico by the end of November, with or without Canada. 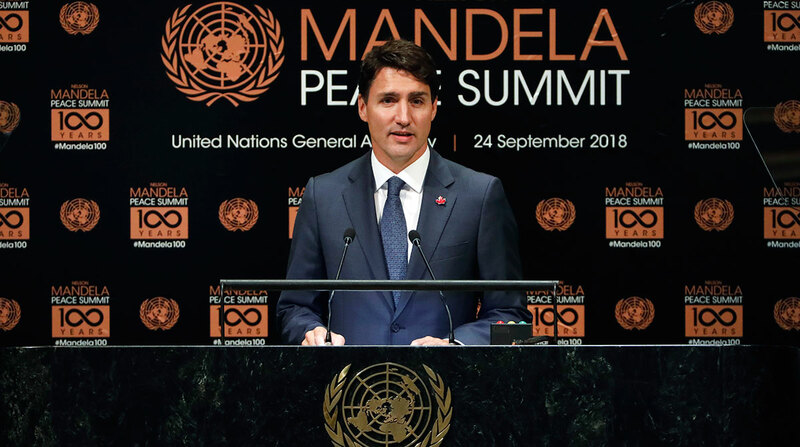 The United States and Canada remain in “near-continuous negotiations,” Trudeau said, adding that his foreign minister — who is leading the NAFTA file — will address the UN on Sept. 29, signaling there won’t be a last-minute bargaining push in Washington that day. “We will keep working as long as it takes to get to the right deal for Canada,” he said. MacNaughton, speaking Sept. 26, in Toronto, said Canada wants to reach a deal that Trump can hail as a victory but nevertheless has red-line issues, including the need for dispute panels and protection from tariffs. On dispute resolution, the Trudeau government wants to keep some form of NAFTA’s Chapter 19 panels, and the United States wants to eliminate them. On tariffs, Canada wants protection from so-called Section 232 national security measures the Trump administration has imposed on steel and aluminum imports from Canada and other countries. The United States also is threatening similar tariffs on auto imports. Auto tariffs in particular “would change the whole relationship for a long time to come,” he added. He said he didn’t know when, or if, those might be imposed by the president. Trudeau called the tariffs “unjust” and noted that Trump previously has said publicly that a NAFTA deal would mean there would be no need for 232 tariffs. Canada needs a NAFTA deal “that involves obviously feeling confident about the path forward,” the prime minister said. A day earlier, Lighthizer also cited Chapter 19 as a sticking point, while saying the subject of 232 tariffs probably would be dealt with later, rather than as part of an overall NAFTA deal as initially sought. He also said dairy is a sticking point. Any final deal on NAFTA will include language concerning gender and indigenous rights, as initially sought by Canada, he said. Neither Lighthizer nor other U.S. negotiators ever cited that as a sticking point in talks, McNaughton said.